Ten of the most influential social psychology experiments. “I have been primarily interested in how and why ordinary people do unusual things, things that seem alien to their natures. Why do good people sometimes act evil? 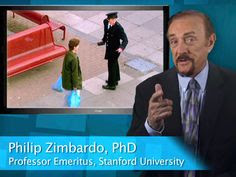 Like eminent social psychologist Professor Philip Zimbardo (author of The Lucifer Effect: Understanding How Good People Turn Evil), I’m also obsessed with why we do dumb or irrational things. The answer quite often is because of other people – something social psychologists have comprehensively shown. Over the past few months I’ve been describing 10 of the most influential social psychology experiments. Each one tells a unique, insightful story relevant to all our lives, every day. The ‘halo effect’ is a classic social psychology experiment. It is the idea that global evaluations about a person (e.g. she is likeable) bleed over into judgements about their specific traits (e.g. she is intelligent). Hollywood stars demonstrate the halo effect perfectly. Because they are often attractive and likeable we naturally assume they are also intelligent, friendly, display good judgement and so on. The Robbers Cave experiment, a classic social psychology experiment, has at least one hidden story. The well-known story emerged in the decades following the experiment as textbook writers adopted a particular retelling. With repetition people soon accepted this story as reality, forgetting it is just one version of events, one interpretation of a complex series of studies. The famous ‘Stanford Prison Experiment’ argues a strong case for the power of the situation in determining human behaviour. Not only that but this experiment has also inspired a novel, two films, countless TV programs, re-enactments and even a band. What social psychology experiment could be so powerful that simply taking part might change your view of yourself and human nature? What experimental procedure could provoke some people to profuse sweating and trembling, leaving 10% extremely upset, while others broke into unexplained hysterical laughter? Many people quite naturally believe they are good ‘intuitive psychologists’, thinking it is relatively easy to predict other people’s attitudes and behaviours. We each have information built up from countless previous experiences involving both ourselves and others so surely we should have solid insights? No such luck. People’s behaviour in groups is fascinating and frequently disturbing. As soon as humans are bunched together in groups we start to do odd things: copy other members of our group, favour members of own group over others, look for a leader to worship and fight other groups. In social psychology the ‘bystander effect’ is the surprising finding that the mere presence of other people inhibits our own helping behaviours in an emergency. John Darley and Bibb Latane were inspired to investigate emergency helping behaviours after the murder of Kitty Genovese in 1964.